This entry was posted on June 3, 2015 at 9:15 am	and is filed under Sathya Sai Baba. 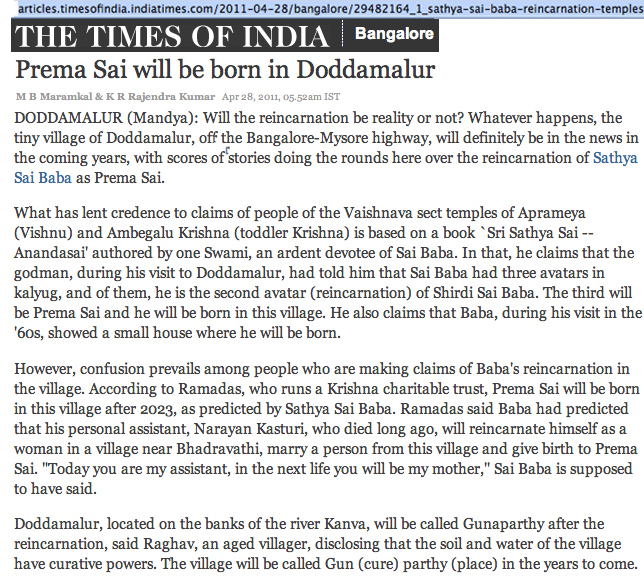 Tagged: Doddamallur, Prema Sai, Sai Baba reborn. You can follow any responses to this entry through the RSS 2.0 feed. You can leave a response, or trackback from your own site. This is sad and comical at the same time. I’m worried about the child. Anil Kumar appears in part 2 – wonder if anyone who speaks Telugu can post what he said? Great coverage and screen shots! Scary about what will happen to the boy in the future, if such worship of him continues.